I want to say one word to you. Just one word. Are you listening? Margins. It’s not the Fed, or unemployment, or someone’s tweets or even “plastics” (sorry Mr. Maguire). It’s that two-edged sword, margins. Margins drove 2018’s outstanding earnings growth, and can choke it off in 2019. Margins contributed most of 2018’s growth. Having set millennium records last year, it’s likely that margin levels will decline in 2019. Operating earnings growth for the first three quarters of 2018 averaged an outstanding 28%. Now there is widespread concern over 2019 earnings growth. The media may entertain many reasons why, but the primary catalyst common to both years is margins1. Margins contributed most of 2018’s growth. Having set millennium records last year, it’s likely that margin levels will decline in 2019. For the past 15-years excluding 2007-2009, operating margin levels have trended virtually flat. The blue bars (figure-1) show 2018 margins significantly above their long-term trend. 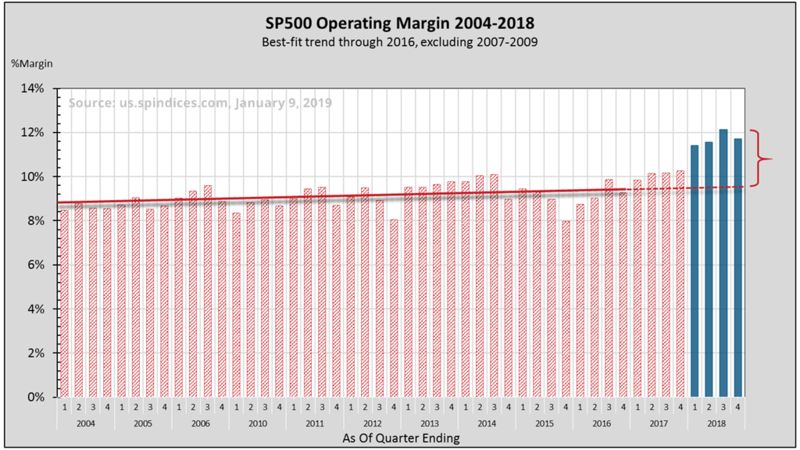 If by year’s end margin levels reverted back to their trend rate2, 2019 margins would contract by about 9.4%. Sales and margins growth combine to produce earnings growth. Annual sales growth3 seldom exceeds 10%. Without help from margins, operating earnings may contract. The S&P 500 Index declined 20% from its September high to its December low. Was the market overvalued? If so, is it still overvalued? Valuation is relative to expected future growth which as I’ve stated is in question. It can be instructive then to compare the current correction to that which bottomed just 3-years ago (figure-2). In relative terms, it seems as if this correction is a bit overdone. But there is a major difference. At the February 2016 bottom, the trailing PE ratio was about 17. Operating earnings over the next two quarters were estimated to grow about 5% (actually contracted 9%). Subsequently, the S&P rallied 59% over two years. At this December’s low, the next two quarters’ earnings were estimated to grow 6.5%, and the trailing PE ratio was 15.6. 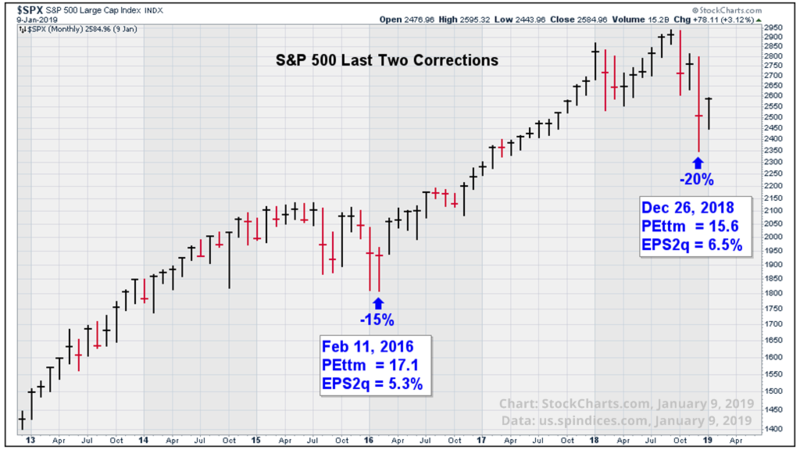 Therefore, in relative terms, it seems as if this correction is a bit overdone. But there is a major difference. In February 2016, operating margins were below trend and rising. Today they are at record highs and forecast to recede. What will be an important determinant of earnings growth in 2019? Just one word. Margins. Margin: Expenses are typically measured in terms of earnings left over from, and in proportion to revenue. Given $100 sales and $92 expenses per shares, margin becomes 8% or $8 per $100 of sales. Increasing margins means decreasing expenses in proportion to sales. Extending the long-term trend from 2016 through 2019 becomes about 9.5%. Declining gradually from 2018’s average 11.7% to 9.5% yields an average margin level of 10.6% for 2019, or 9.4% below 11.7%. Blended sales growth has averaged about 8.9% in 2018, including Q4 which is an estimate. Price charts produced using www.stockcharts.com. Earnings data from S&P Dow Jones Indices, us.spindices.com as of January 9, 2019, with approximately 4% of S&P 500 companies having reported fourth quarter 2018 earnings. Therefore, full year 2018 estimates are a blend of 76% actual, and 24% estimated figures.